Watch: Is Coconut Oil or Butter Healthier? For the longest time, the only oil I bought was extra-virgin olive oil. After all, it’s high in heart-healthy antioxidants called polyphenols and monounsaturated fats, which can help lower “bad” LDL cholesterol and raise “good” HDL cholesterol levels. Then a friend, who was also a chef, told me that there are actually times when olive oil is not the best choice. So I looked into the best uses for olive oil, and when to choose another oil. 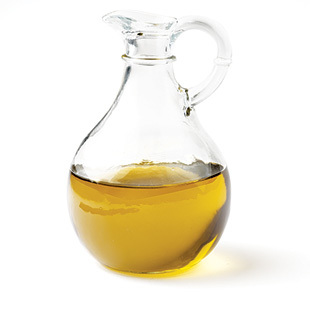 When to use olive oil: When you’re making salad dressing or sautéing vegetables over medium heat, olive oil is an excellent choice. Since it has a distinct flavor, use it in dishes where you want to taste it—drizzled over steamed vegetables, soup or bread, for example. Olive oil has more monounsaturated fat than other oils, making it a great choice for heart-healthy cooking. Find out the difference between extra-virgin olive oil and other olive oil labels and learn the winners of our olive oil taste test. When to skip olive oil: If you’re cooking over high heat, don’t choose olive oil. Olive oil has a lower smoke point—the point at which an oil literally begins to smoke (olive oil’s is between 365° and 420°F)—than some other oils. When you heat olive oil to its smoke point, the beneficial compounds in oil start to degrade, and potentially health-harming compounds form. What to use instead: Canola oil, on the other hand, has a higher smoke point and is a good choice if you’ll be cooking over high heat, as when you’re roasting vegetables or sautéing food over high heat. It also has a neutral flavor and is packed with heart-healthy alpha-linolenic acid (an omega-3 fatty acid), which makes it ideal for baking. It’s also cheaper than olive oil, so if you’re trying to trim your grocery bill then canola oil is a good option. Most of the canola oil in the United States is made from genetically-modified canola seeds, however, so if that’s a concern, choose organic canola oil. Peanut oil has a very high smoke point, and so is also good for high-heat cooking, like stir-frying. Although more expensive, avocado, macadamia nut, tea and almond oils are also good mono-rich choices for everyday use. Butter or Margarine? Is There a Healthy Butter Substitute?